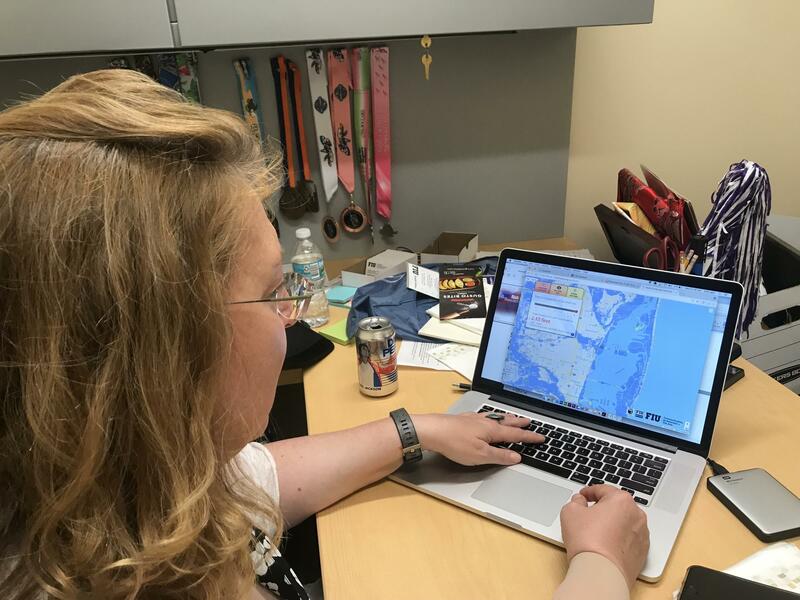 Susan Jacobson is a co-creator of the Eyes On The Rise app, which allows users to enter their addresses and see how sea-level rise might impact their neighborhoods. To help homeowners and businesses plan for the impact of the rising seas on their property, a team at Florida International University developed an app called Eyes on the Rise. 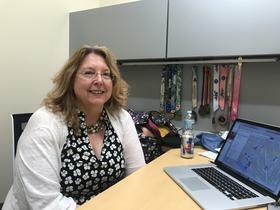 WLRN’s Kate Stein spoke with one of the app’s creators, journalism professor and digital media specialist Susan Jacobson. Susan Jacobson, one of the creators of Eyes on the Rise, explains how the app allows users to see how flooding from sea-level rise might impact their homes or businesses. With the local coding group Code For Miami, Jacobson also has worked on another app, Will It Flood?. That app helps homeowners and businesses understand when their neighborhoods see flooding because of high tides. WLRN: So, tell us about the Eyes on the Rise app. How does it work? Jacobson: Enter your address, and it will tell you then what your elevation is, based on calculations by Google elevation. And then it will allow you to slide a little slider to see what the impact of six feet of sea-level rise might be on your property. WLRN: And you can select different levels, right? Like two feet or four feet or kind of incrementally. Jacobson: Yes, you can select up to six feet. And what happens is the map turns blue in the areas where there is water. So you might live in a in an island of dryness but it might be difficult for you to get to work or to get to I-95, for example. WLRN: Do you think it's realistically feasible that people could have desert islands where their houses are? Where they couldn't get to school or work or the hospital? Jacobson: Well, yes. Yes, it is definitely possible. When is this going to happen, is another question. The devastating impacts of sea-level rise on Florida are still many years away. We will have what's sometimes called nuisance flooding, when the tides high tides are at their highest, increasing over the next few years. There's no way to get around that. WLRN: Are you from South Florida originally? Jacobson: I'm from a little town called Venice, Florida, which is over on the west coast of Florida just south of Sarasota. And believe me, when I was growing up in Florida, we'd never heard of climate change. And as soon as I graduated from from the University of Florida College of Journalism, I ran up and lived in Manhattan and Philadelphia for like 20-plus years and then came back to Miami in the fall of 2013. And I noticed that when I parked my car by my apartment building in the fall, I came out and it would be in water. And I was like, sea-level rise -- what is that? [Laughs.] And I found I had a very practical reason for wanting to be more informed. I just wanted to move my car when the water was going to be there so, you know, it wouldn't mess up my car. WLRN: You've also worked on another app with the local programming group Code for Miami. What is that all about? Jacobson: We have a site, it's called Will It Flood? And what this does is it shows you a calendar of the high tides. So we built this specifically to give people that kind of heads up. WLRN: Has working on this project changed the way you think about living in South Florida? Jacobson: I just bought a condo. You know, I'm staying here. I paid attention to the flood zone my condo was in and its elevation. WLRN: When you bought your condo, did you put the address into the app? Jacobson: Oh, you bet I did. However, I will say this: we did not build this app to be the last word on whether or not you should make a real estate purchase. It's a point of information. If you are really concerned, there are local companies out there that will do a professional evaluation of the property that you want to buy and let you know in more detail and with more precision what the risks are. WLRN: Working on this project probably gave you a pretty good sense of some of the places in South Florida that are vulnerable -- so, Miami Beach is one. What other places? Jacobson: The Shorecrest neighborhood in Miami... the Matheson Hammock Park area [in Coral Gables]. Matheson Hammock Park can turn into, like, a lake during the highest of the high tides. Some of the areas around the Miami River. Las Olas in Fort Lauderdale. Parts of Doral. It's not just the cities or the areas on the coast, although they're usually the first to get hit. Between flooding and our drinking water, the sea level rise story is -- really -- it's the biggest story in South Florida.